1976: Prototype coil-sprung 100" (wheelbase) Land-Rover on a Range Rover chassis. The 100" project was terminated in 1986 after about 70 prototypes. Over a number of years, starting in approximately 1977 Land-Rover was experimenting with different wheel bases and spring configurations. They were based on a Range Rover chassis some of them and were intended for the Swiss or French military market, both of which were at the time known to be looking for a new utility vehicle. In the end both countries bought other products. A number of these vehicles were 100 inch wheel base. The project over time went through at least 70 experimental versions. Some of which ended up in the 110 development program. 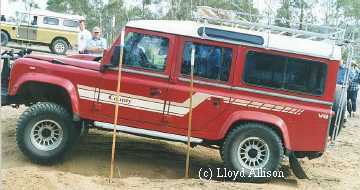 1977: Prototype 90" coil-sprung Land-Rover on a cut-down Range Rover chassis. 1978: Swiss army interest in 100". Prototype 110" on 110" extended (ambulance) RR chassis. 1983 March: The coil sprung Land-Rover 110 was introduced at the Geneva International Motor Show - V8 3.5L (114bhp at 4000rpm, 185 ft-lb at 2500rpm), LT95 4spd full-time 4WD, or 4cyl 2.25 and 2.25 diesel, LT77 5spd full-time 4WD (LT230 transfer case), or optionally part-time 4WD (dropped in one year). The vehicles had front disc brakes. 1984: The short wheel base coil sprung Land-Rover 90 (92.9" wheelbase) came out in mid 1984. 1985: Santana 5spd gearbox used in V8s. 1989: Hard-tops lost the three external ribs that had been there since the `Series' vehicles, making for a cleaner roofline. 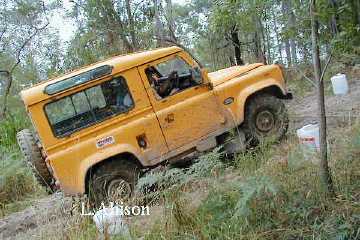 1990 late: 90, 110 become `Defender' D90, D110.